POSTS Best Weight Loss Belts: Which One Is Right For You? When you work out, you want to take every step you can that will help you get to your goals a little faster. If a vitamin or supplement will help, you take it. If a particular workout will help, you do it. When you get to a certain point along your fitness journey, something like a weight loss belt can help, too. If I were to pick one, I would have to say I’d go with the TNT Waist Trimmer. Any of these things are going to help you sweat more. But what I like about this one is that it is extra wide, has an anti-slip technology, and is engineered to repel moisture. Not only will it cover more of me, but it will not bunch up during a workout, and it will not stink as bad thanks to the moisture wicking ability. When I buy something, I want to be effective, comfortable to use, and not smell bad. But the TNT Waist Trimmer is not a perfect item. It has drawbacks just like anything else. Let’s examine what makes it a good buy along with those drawbacks. On Amazon, 4,029 people reviewed this item for an average rating of 4.4 stars. Size: since it is wider than most, it is great for a bigger person like me. Someone who does not have a big belly and just wants to burn off some more water weight could find it too wide. But it also comes in a variety of sizes so that it can fit all sorts of body types. According to one reviewer on Amazon, the XL version works well for people as big as 375 lbs. Anti-slip technology: If you have ever worn a weight loss belt than you know the most annoying thing about many of them is the fact they tend to bunch up as you were them. This one claims it doesn’t, and the reviews back up that claim. Moisture-wicking technology: We’ve all that t-shirt and shorts that somehow missed the washing machine and got to sit there on the floor and develop a terrible odor. Maybe it was a favorite hat that you had to wear for every workout. Thanks to moisture-wicking technology, the TNT waist trimmer doesn’t retain that sweat (like your favorite hat). You still need to wipe it off, but it isn’t going to smell nearly as bad as your hat does. 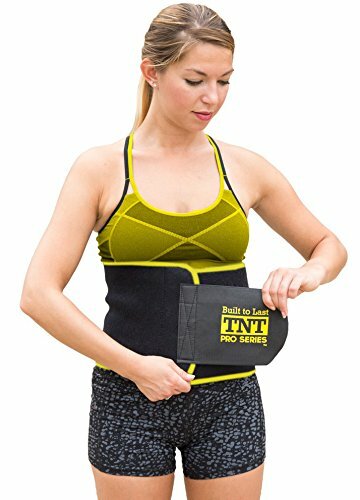 Size: While a larger person may like the extra width, people with smaller torsos are going to find the TNT Waist Trimmer too wide for them to use. Velcro: A handful of reviewers complained about the Velcro becoming weak after a couple of months of use. They began to have trouble keeping it on because the Velcro would no longer hold. Smell: Another handful of reviewers complained that their item smelled. Some said the scent reminded them of paint thinner. Several said it smelled like gasoline. One even said it was strong enough to make him want to throw it out. The TNT Waist Trimmer has enough of the features I like that I would spend money on one of these. If at all possible, I would try to find one at a store. That way, if there was an issue with the smell I could easily return it for one that is odor-free. The Velcro is a concern, but that is going to be a drawback of every waist trimmer on the market for anyone that doesn’t already have a nice-looking waist. But it isn’t the only one worth buying. Had this one said that it had anti-slip technology rather than that it “limited slipping” I might have made it my top choice. 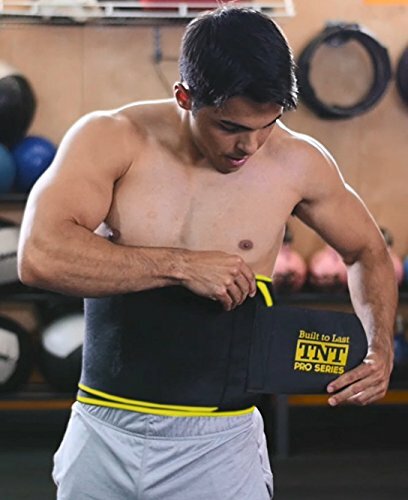 The width of the TNT Waist Trimmer is nice, but I like that this one comes in an even wider variety of sizes—including an XXL version that could fit the truly large. I’m a little skeptical of this cream/gel that comes with the Sweet Sweat Waist Trimmer, but many reviewers seem to think it works. Otherwise, it is not much different from the TNT Waist Trimmer. On Amazon, 8,008 people reviewed it and gave it an average rating of 4.5 stars. Sweet sweat gel: If it can help me lose a little more from my belly, I’m all for trying it (and the Sweet Sweat Waist Trimmer comes with a free sample). Natural flexibility and contoured design: whether or not this thing will fit nicely around my waist will go a long way towards whether I actually wear it. Limitations of the inner grid lining: They say that it repels moisture (which is a plus) but that it limits slipping and bunching. Maybe they are just being honest, and the TNT Waist Trimmer isn’t. But if it didn’t say ‘limits,’ I’d grade this one higher. It’s 100 percent Neoprene, so if you are allergic, this item is not for you. The only thing that makes me hesitate is that it says it just limits slipping and bunching. I have a hard time buying this one knowing that it very well may do just that. But if after trying the TNT Waist Trimmer I discover that their’s does as well, my next one will be the Sweet Sweat Waist Trimmer. 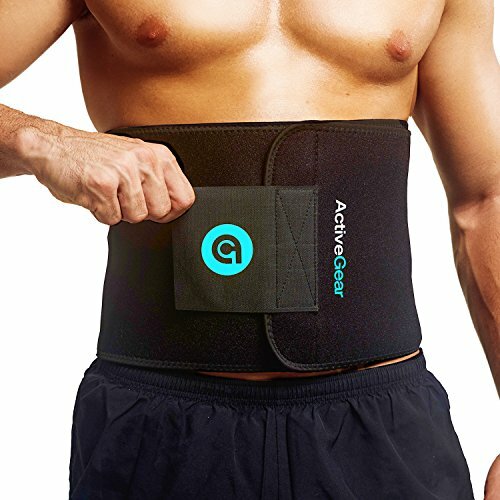 What grabbed my attention about the ActiveGear Premium Waist Trimmer Belt has a money back guarantee. If I don’t like it within a year of buying it, I can return it. If the velcro ends up being too weak or it doesn’t do its job, back it goes, and it doesn’t cost me a dime. No harm, no foul—right? Well, you could also say that the time spent using it is time wasted if you end up returning it. But with a product like this, the added security of the return policy makes it an intriguing purchase. There are 810 reviews for this product on Amazon who gave it an average rating of 4.5 stars. Anti-slip flex design: Not only does the ActiveGear Premium Waist Trimmer Belt not slip, but it repels moisture as well! You may not sweat as much as you’d like with the ActiveGear Premium Waist Trimmer Belt. Since that is the purpose behind wearing one of these, that could be a deal breaker. Lightweight material: Some reviewers complained that it was easy to tear and not durable enough for more than light-to-moderate use. Limiting sizing: it only comes in two sizes; one that fits up to a 48” waist and another that fits up to a 52” waist. 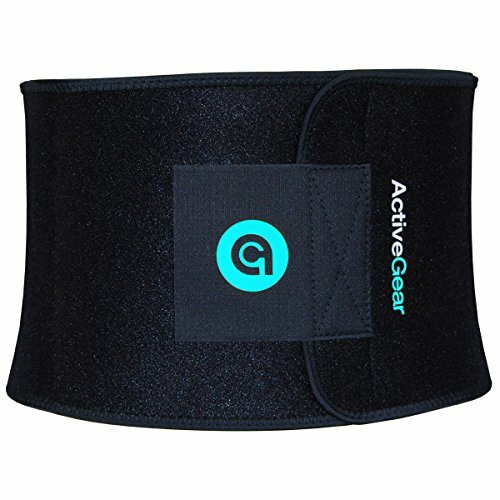 The biggest difference between the ActiveGear Premium Waist Trimmer Belt and the other two is that it is a few dollars less. If saving a few bucks means that much to you, go for this one. But if you’d rather spend a couple more for a product that will do more for you, take one of the other two. I’m a sucker for a bargain but will back away from one I have doubts about regarding its quality. 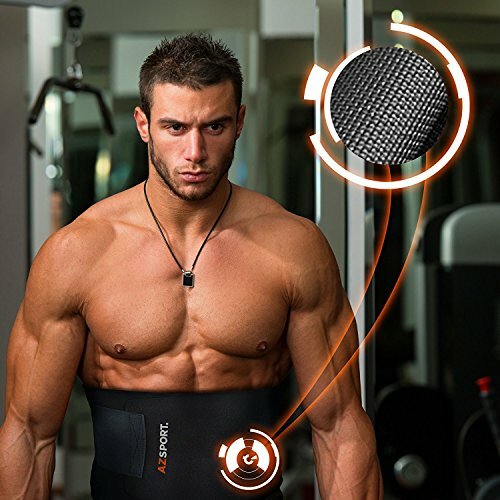 But what would make me back away from the AZSPORT Waist Trimmer may not matter to others. On Amazon, 2,193 people reviewed the AZSPORT Waist Trimmer and gave it an average rating of 4.3 stars. 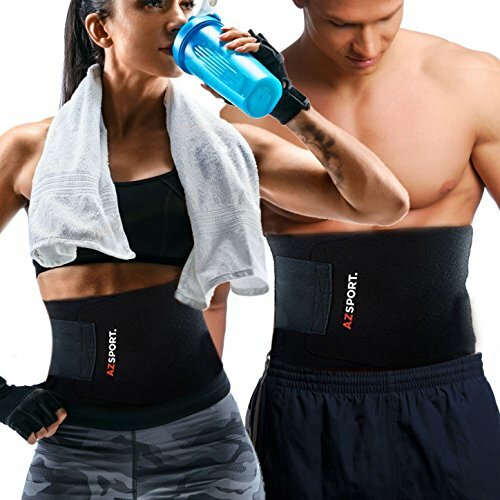 Prices can always vary and are subject to change, but of the ones reviewed, the AZSPORT Waist Trimmer one cost the least on Amazon at the time of the review. A few reviewers described the Velcro as being “super strong.” For an item such as this, that is a major selling point. Nothing is more frustrating than wearing one of these for two months and then having the Velcro give out. Money back guarantee: It certainly doesn’t hurt to know you can get your money back if the item doesn’t work for you. One size fits most: That’s like saying it should fit you, but if it doesn’t, we never said that it absolutely would. Why not just be honest and put a size range on the box instead? To be fair, the product description on Amazon says, “up to 50” waist.” For a fitness product, you’d think they’d be more precise. Many reviewers felt the AZSPORT Waist Trimmer could be a lot wider than it is. Many also complained that it rolled up as they worked out. Those reviewers felt it was designed for someone who was already pretty fit and not someone looking to get in better shape. If you are looking for a bargain-priced item, the AZSPORT Waist Trimmer is the one for you. It is inexpensive, and it can get the job done right—but it may not fit you. It would be nice not to have to worry about whether you may have to return something that doesn’t fit. That’s the gamble you take in order to save a little money, though. But if you are open to spending a little bit more for a better product, you are better off purchasing something else. Like any product in the fitness category, you are going to get what you pay for. Does that mean you need to always go with the highest priced items? Of course not. Does that mean you should never go for a bargain-priced item? No. What it does mean is that you should figure out what you want in a product first. Once you have, examine your options to see what works best for you. If a cheaper option works out- great, buy it. But if it doesn’t, the key when it comes to fitness products is to get something that does work. 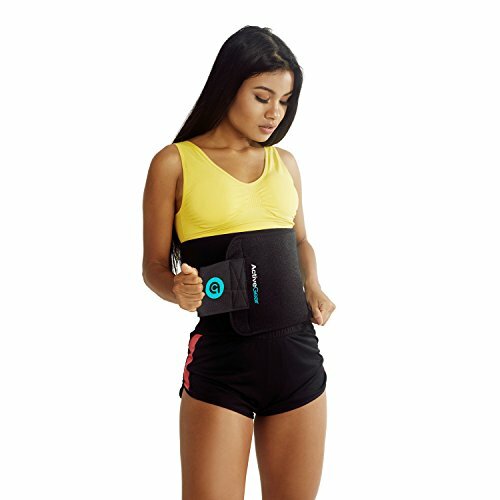 When it comes to buying a waist trimmer belt, since most are not too expensive, cost doesn’t have to be a significant factor. You can focus on just getting one that works for your needs. 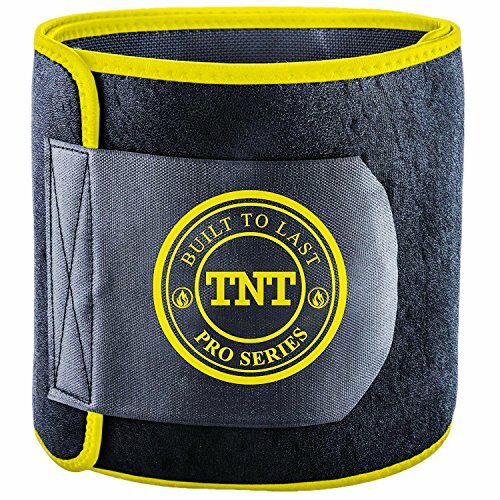 For me, when it comes to weight loss belts, it is the TNT Waist Trimmer of Sweet Sweat. The sizing options are a big selling point. Plus I like the moisture wicking and the anti-slipping technology.